Synthetic peptide: RISKLEQQMAKIAA, corresponding to C terminal amino acids 461-474 of Coronin 3. Our Abpromise guarantee covers the use of ab15719 in the following tested applications. WB Use a concentration of 0.2 - 1 µg/ml. 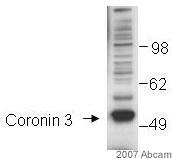 Detects a band of approximately 55 kDa (predicted molecular weight: 55 kDa).Can be blocked with Human Coronin 3 peptide (ab23272). This blot shows significant non-specific background staining. Increasing the length of the blocking step and including a blocking agent in the primary antibody solution may reduce this. Publishing research using ab15719? Please let us know so that we can cite the reference in this datasheet.